They yearn because they have been taken into care, fostered or adopted. The titles in this extraordinary series are a vital resource. Nine practical guidebooks, each with an accompanying beautifully illustrated storybook, have been written to help children (aged 4-12) think about and connect with their feelings. These guides and stories enable teachers, parents and professionals to recognise the unresolved feelings behind a child's behaviour and to respond correctly to help. Each guidebook focuses on a key feeling and is written in very user-friendly language. The exercises, tasks and ideas for things to say and do are specifically designed to help children think about, express and process the feeling to the point of resolution. 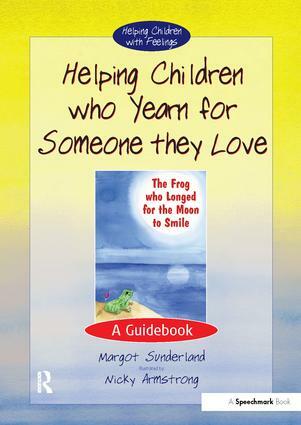 This is Margot Sunderland’s bestselling series of therapeutic stories for children, each accompanied by a professional guidebook. The practical guidebooks enable teachers, parents and professionals to help children aged 4-12 connect with unresolved feelings affecting their behaviour. Each guide focuses on a particular feeling, with exercises and ideas to help children think about, express and focus on that feeling to the point of resolution. The illustrated stories are designed to be told alongside the guide, but can be bought and used independently. Interested in purchasing multiple sets within this series? Please contact our dedicated Sales Executive Louise Perrier at Louise.Perrier@tandf.co.uk or call +44 (0) 20 755 19109.